The company has emerged as a highly acclaimed Manufacturer, Exporter & Supplier of Tube Filling, Sealing and Crimping Machine. The Tube Filling, Sealing and Crimping Machines are known for their versatility and high efficiency. The company offers the Best Tube Filling, Sealing and Crimping Machine at the best prices on a timely basis. (Rotomax x 50) Optimum speed 50 tubes / Minute. (Rotomax x 35) optimum speed 35 tubes / minue. Filling accuracy 1% of fill weight. Proven high quality hot air sealing system for plastic & laminated tubes. Filling system-positive suction & Displacement. A combination sealer for both metal tube folding, laminated & plastic tube sealing. 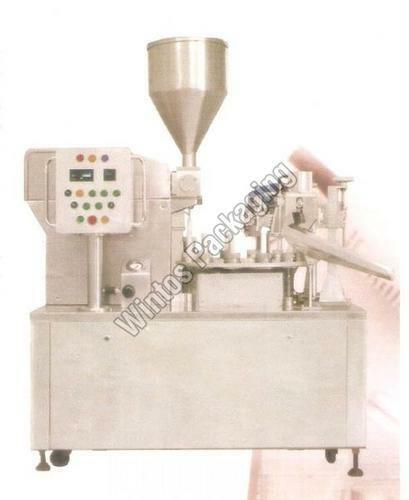 Wintos Packaging offer an extensive range of Industrial Packaging Machines which includes Filling Machine, Sealing Machine, Automatic Screw Capping Machine, Automatic Sticker Labeling Machine, Perfume Bottle Valve Crimping Machine, Over Wrapping Machine, Automatic Labeling Machine, Automatic Flow Wrapping Machine, Aerosol Filling and Crimping Machine etc. Within a short span of time and with our hard efforts, we have carved a niche for ourselves as one of the preferred industrial Machine Manufacturers, Exporters & Suppliers. With our optimum range of machines, we serve various industries such as Pharmaceutical, Packaging Cosmetics, Food, Adhesive, Lube Oil Industries, Chemical etc. Our products are highly demanded by all the industries for the excellent quality that we serve. With our customer centric approach, we endeavor to provide utmost satisfaction to our clients. We even customize our products according to the client's exact specifications. Our services also demonstrate our reliability and the customers really appreciate them. Further, we endeavor to maintain the trust of our clients, by serving them with utmost care and dedication.